You are a pilot. A time fighter, fighting a battle against aliens that are attacking the world in the air on land and in the seas. A Time-portal, secretly invented by the great Leonardo da Vinci, will send ,ou into the future to help fight the battle in 5 different time periods. Beware of the weather. For it can be rough in the Snow and Lightning Rain. Tornados can blow your plane out of control forcing you to go the direction of the wind. The greatest battle of our planet begins. Make sure that you are up for the challenge! Fight aliens throughout time, on land, sea and in the air with your aircraft. You are a pilot! A timefighter that fights aliens through time! Aliens on land, in Sea and in the Air. They come in all sizes!!! Are you up for a big fight? A sidescroller plane shooter. Fly and shoot in different time periods. 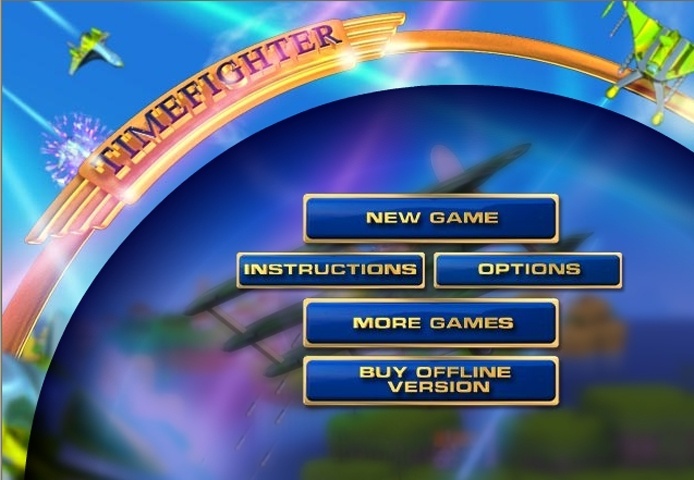 If you want to play Time Fighter games online you have come to the right place! GamesLoon adds new Time Fighter games every week. This is your game portal where you can find the biggest collection of free Time Fighter games online. Do not forget to rate our Time Fighter free online games while playing!